In high school and college, I would spend hours at the mall stopping at stores in search of as many clothes possible. My time on the weekends would be spent with friends at the nearest clothing store trying on new clothes leaving with too many bags to carry. In the last few years my shopping has become either shopping online or making a stop in the women’s section at Target when I am there for grocery shopping. My desire to get in a dressing room and spend hours trying to find an outfit has gone out the window. Hence why Stitch Fix is up my alley when it comes to clothes shopping. What is it? 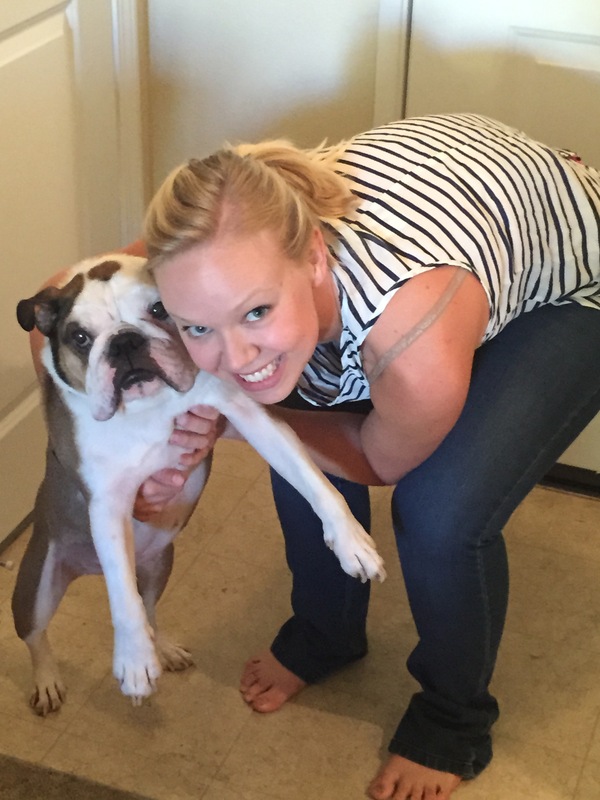 Stitch Fix is a service that is tailored to your style & clothing preference. I always sum it up as a way to try on new clothes in the privacy of your own home. After you sign up you fill out a style profile with sizing and preferences of style, color and price. You pay $20 for a styling fee which includes a delivered box with 5 hand-picked items for you. However, if you keep at least one of the items in the box, the fee will be applied to the item. If you keep nothing you lose the $20 styling fee (I have received 14 boxes and have only once lost my $20 fee). Once you have tried everything on, you send back what you do not want in their prepaid envelope within 3 days. I have always loved at least one item in my box. 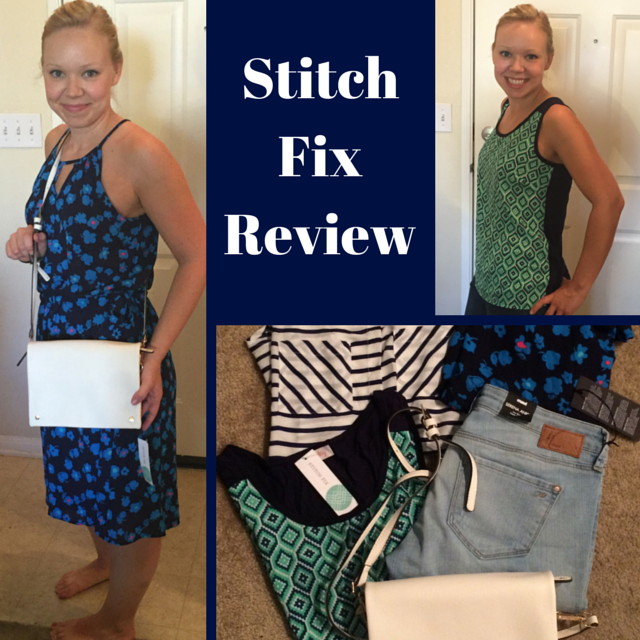 Stitch Fix offers one time fixes or monthly services as well. Emma was not feeling this shirt.. actually she might have just not been feeling me forcing her to take a picture. 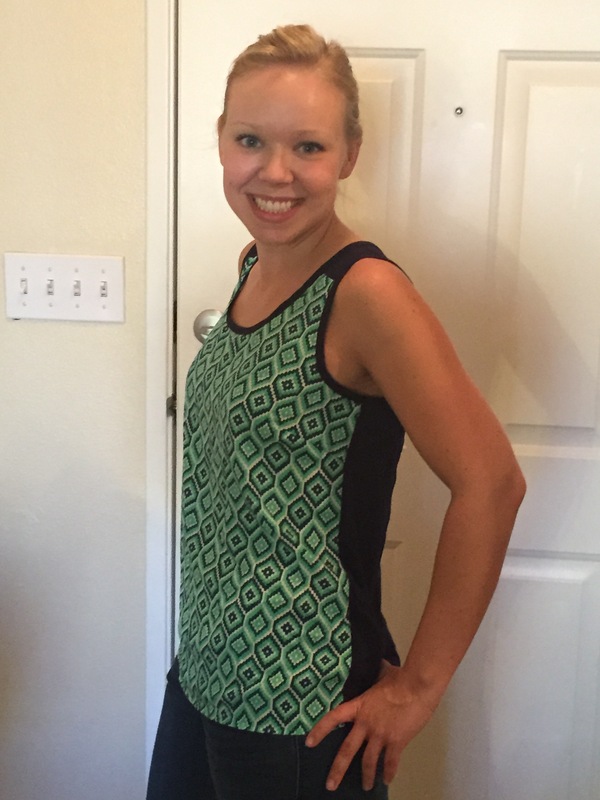 I loved the color and fabric of this top! It seemed fitting for summer as it was lightweight, perfect for my upcoming trips. However, the fit was a little too loose for my liking. A size down would probably be better but I am on the fence about keeping it. The colors and pattern of the tank caught my eye. It seemed just like something I would pick for myself which is why I did not want to keep it. It did not wow me and was too typical of my wardrobe. I prefer to keep items that will help to change up my wardrobe a bit. I LOVE LOVE LOVE this bag! 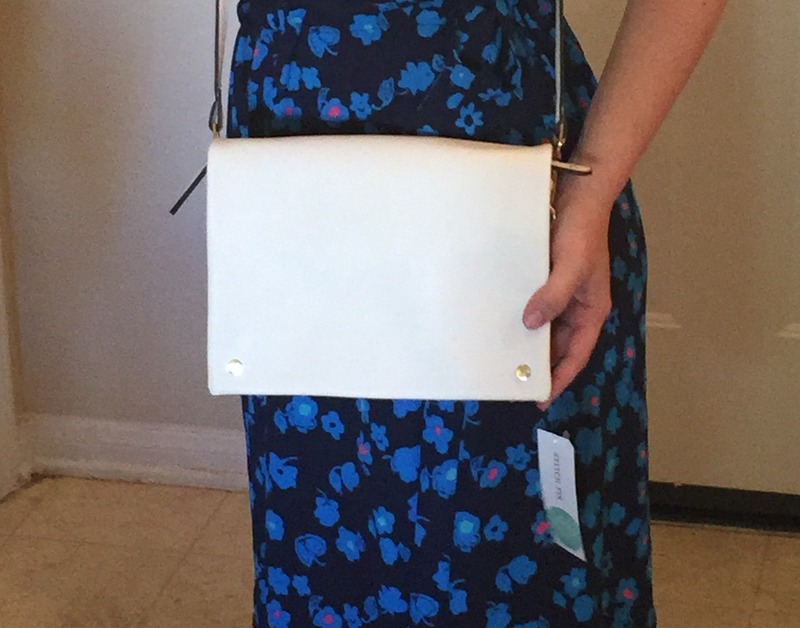 3 zippers in rose gold, a cross body that can also be a large clutch. Just perfection- this piece makes the whole box worth it to me. A wonderful bag that will be extremely useful when traveling! My face says it all in the picture. I wear dresses 90% of the time so I was really excited to try it on. The color and pattern were catered to my preference by the fit was all wrong. It was too loose with too much fabric that it added extra weight to my frame. I was skeptical at first because I do not prefer light color jeans. Unfortunately I am not a skinny jean person. I thought I mentioned it on my profile but will have to make sure that for future boxes they send me boot cut or boyfriend. The sizing was great but I could not get past the style. All in all I was happy with this fix because I did like one item to apply the styling fee to. I will be sure to add pins to my Stitch Fix board so my future boxes will be tailored even more to me. I have found the best fixes are those where I reference my Pinterest page. Make sure to be as specific as possible in your profile as you will have better success instead of letting them surprise you. Tell me: Do you like shopping at stores or do you prefer to shop online? Love the bag, the dress swallows you up its top big. 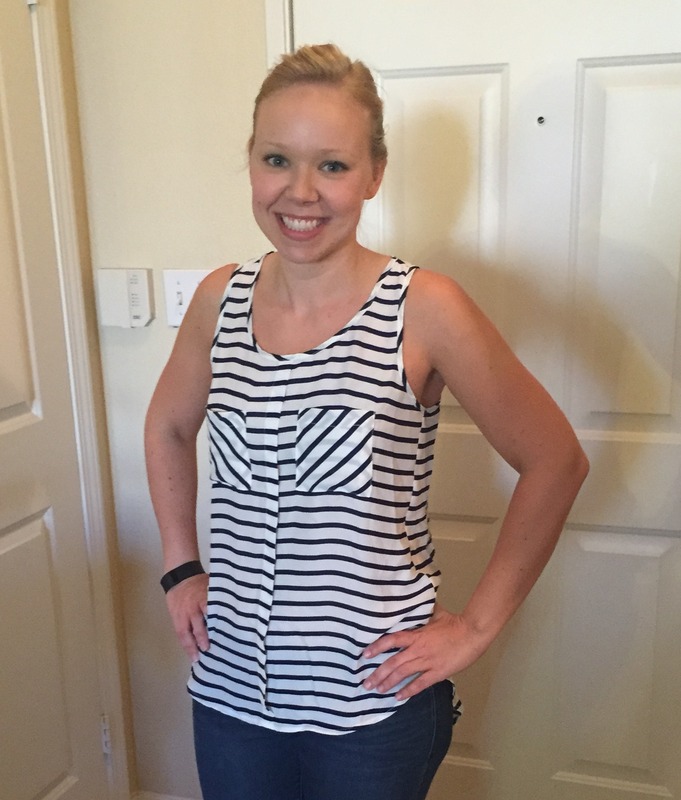 The tops are just ehhh, and like you said, the point of stitch fix is to step outside the box!